February 2017 – THE BOOKS THAT TIME FORGOT. In January 1968 the Marine base at Khe Sahn came under siege. Twenty thousand NVA troops attacked the garrison of 6,000 Marines for seventy-seven days. It was General Giap’s plan to replicate his decisive victory over the French at Dien Bien Phu. President Johnson became obsessed with the battle. A lost of Khe Sahn would be a crushing victory. So he had a scale model built at the White House of the battlefield. Massive airlift of supplies and around the clock bombings against the NVA. Captain Gerber and Sgt. Fetterman are assigned a mission. They are to lead a team to the suspected headquarters in Laos and assassinate General Giap. 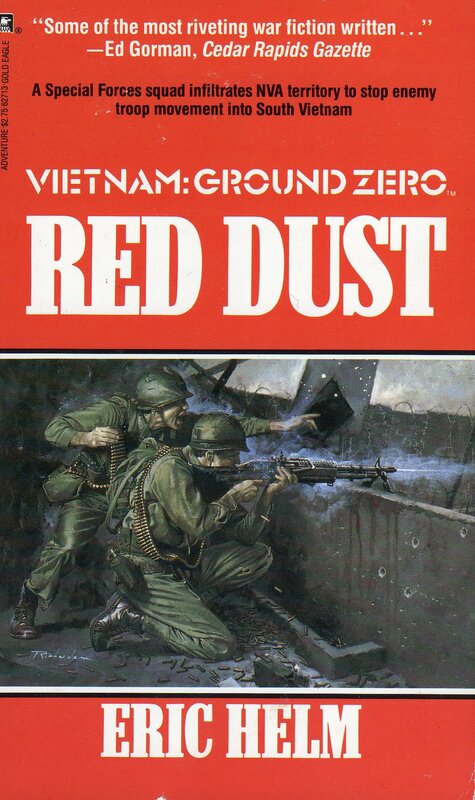 The second Super Ground Zero book in the series. This one dealt with the battle of Khe Sahn. Actually this book is mainly about that famous siege. Most of the book tells the story through various people that participated. A Marine who fights on the line at Hill 861. The Air Force pilot that pilots the C-130 resupply. The Army Colonel who is assigned to the White House to monitor and keep President Johnson up to date on the latest intelligence. President Johnson is portrayed as obsessed with the battle believing that another Dien Bien Phu would bring down his presidency and the war. In fact the North Vietnamese only success was overrunning the Special Forces camp at Lang Vei. They used PT-76 Soviet amphibious tanks. The LAW rockets proved useless against the tanks. In fact the Marines had problems with their M-16s. The gunpowder used caused them to jam. The plot involving the assassination attempt was sort of just thrown in. Historically Giap was in Hanoi and history is not changed in this book. The guys do manage to assassinate a high ranking officer. Their main purpose seems to be showing the reader what is going on outside the battle. The stacks of bodies and devastated landscape from massive B-52 bombing. The overrun camp at Lang Vei. This actually contradicts the account in Red Dust where they heard about it for the first time. In this book they are there witnessing it. The problem of having other writers come in on this series. The battle was a victory for the Americans. The Marines lost a few hundred while the NVA lost thousands. The massed artillery and airpower prevented them from ever massing their troops and couldn’t properly overrun the camp. The NVA eventually lost interest and the siege that Johnson was so obsessed with ended in a whimper instead of a bang. The base was a few months later abandoned and bulldozed down by the Marines. So the base that thousands died for became irrelevant. This was a very interesting book for its depiction of this battle. A VC is using the airwaves to lure Americans into a trap. He speaks like an American and knows the radio terms that are used. They will later find American helicopter crews butchered. The survivors horribly disfigured. This is a psychological ploy to have disfigured vets come home to demoralize the war effort. He also calls down artillery strikes on American patrols. The military wants this individual stopped so Sgt. Fetterman leads the unit responsible for tracking down this VC. Meanwhile Gerber is assigned a mission to fly on a special mini-helicopter and drop homing devices so the B-52s can hit NVA troops massing at Khe Sanh. Moon Cussers come from the nineteenth century and were unscrupulous men that would go on moonless nights with a potbelly stove. They would simulate a lighthouse and lure ships onto the rocks and then loot the cargo. They cussed the moon because they could not ply their trade when it was out. An interesting historical tidbit and explains the title. The NVA in question is a American college educated man so that is how he can speak like an American. He also has been make fun of all his life because of his short size so has a lot of axes to grind. He gets off on the power he now exercises as a NVA major. He of course finally gets his just deserts. An interesting idea for a villain and an enjoyable entry in this series. The hamlet of Duc Bang next to the Cambodian border is part of the new strategic village concept. The plan is to arm and train the local villagers to defend themselves. During Tet the American and ARVN troops at the hamlet are withdrawn to fight the attacks. The local VC make their move and attack finding villagers left with old obsolete WWII weapons. They kill the men and destroy the bunkers build. The high command sends Mack Gerber in to rebuild the hamlet and train the villagers. Instead he finds a demoralized population that wants nothing to do with him. Meanwhile a battalion of VC are gathering to destroy the Americans. 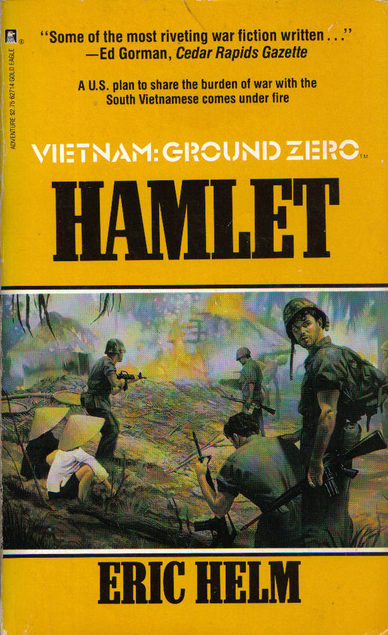 The action in this book takes place around the hamlet of Duc Bang. Such an obscene sounding name in English. It explores the strategic village initiative. The idea to make the Vietnamese more self sufficient in the war and not dependent on the American military. A solid plan on paper but not very successful. The local villagers bug out because they know there is an attack coming leaving the Americans all alone to face it. A general at the end brings out a Congressional delegation to show how successful the program is while withholding the basic failure. Yet he knows its a failure but continues to sell it. Vietnamization is popular and nothing is allowed to rock the boat on the concept so everyone goes about with the delusion of its success. This story illustrates the politics that interfered with sound judgement during this war. A very good story. After Tet the North Vietnamese are taking a more active role in the war. Men and materials continue to come down the Ho Chi Minh trail. The Americans come up with a plan to monitor the flow of supplies. They will insert teams into the north and plan tulips. These tulips are seismic sensors that will alert when there is movement so an airstrike can be launched. Captain Mack Gerber and Sgt. Fetterman are assigned to form a team and jump around the airbase at Phu Tho. After they plant the tulips the team then gets involved in taking out the personnel at the airbase to gain access to a radio to arrange a pickup. This book I believe has a different writer. 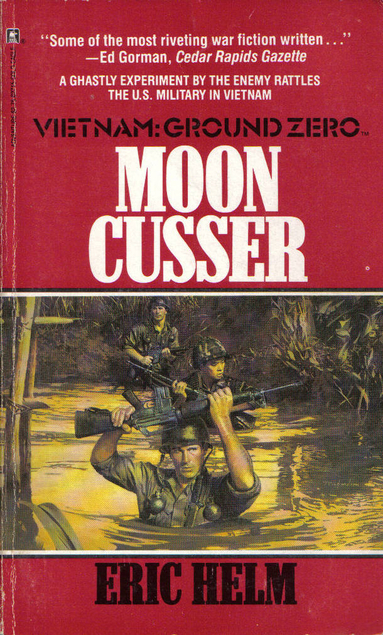 The name Eric Helm was the pen name assigned to this series. These series usually had a generic name to give the impression that they were written consistently by the same author when in fact it was usually assigned to different people. 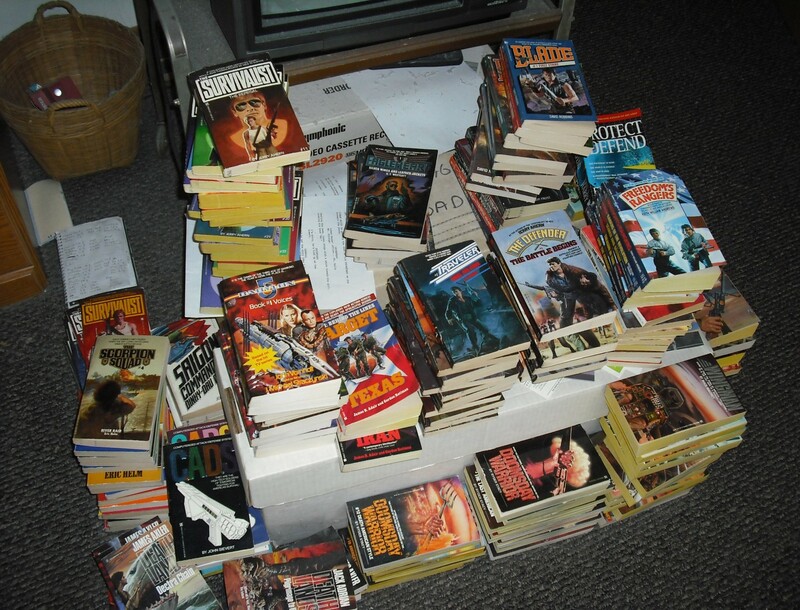 Kevin Randle was responsible for most of the books in this series. This book obviously had a different style. It had some weird touches throughout. A victorious Phantom after shooting down a MIG decides to put a sidewinder into a water buffalo. The guys find a peace activist at the base they take over and drug her up with the morphine she brought in the medical supplies so she can’t give away any information about them. 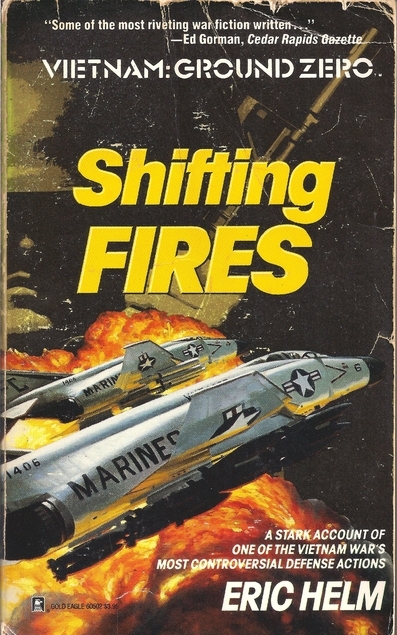 The ending seemed rushed with a NVA officer who was bitter at losing his family to an bombing raid. He took out his revenge by gutting captured pilots. He is eventually stalked and disemboweled by a Bengal tiger. Still in spite of the disjointed plot and over the top weirdness this was still an interesting book. The story was still fast paced and kept my interest.